Football season has finally arrived! If you are anything like my family, football season means gathering around the house, watching the games, and eating great food. Once we are home for the season, I’ll have a weekly football recipe that is great for snacking and sharing. 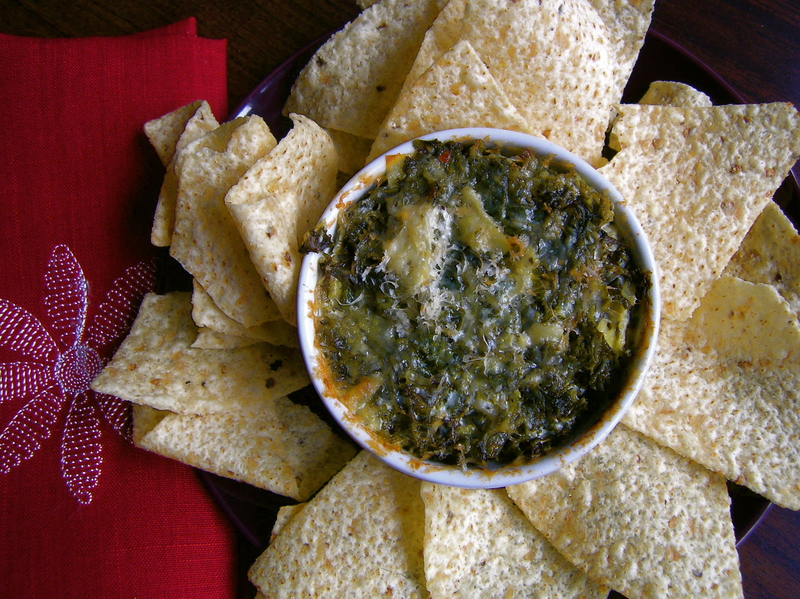 Football food tends to be on the heavier side, so I made this Kale and Artichoke Dip as a lighter alternative to some of the heavier chips and dip dishes. Serve it with an assorted plate of vegetables to reduce excess calories. This is the time of the year when mindless snacking starts to creep up on people. Enjoy the games with healthier alternatives so that you don’t have to start making New Year’s resolutions involving weight loss in a few months! Bring a small pot of hot water to a boil. Add the baking soda and the kale, simmer for a minute, and drain into a colander. Rinse with cold water to stop the kale from cooking. The baking soda keeps the kale green and prevents it from turning brown. In a medium bowl, mix together the cream cheese, yogurt, sour cream, and mayonnaise. Add the garlic, onion, red pepper flakes. Use a spatula to fold in the kale and artichoke hearts. Season to taste with salt and pepper. Spray an 8 x 8 inch baking dish or a small 6 inch round dish with cooking spray. Add the dip to the pan, using the spatula to make an even layer. Sprinkle the Parmesan cheese on top. Bake in the oven for 20 minutes. Serve warm with chips and mixed vegetables. Yum! I need to try this soon. Artichokes are my favorite food! Great Recipe, I am going to try it for an up coming Executive function at work. They are always looking for healthy appetizers.